Welcome to your Pop Up Hub. 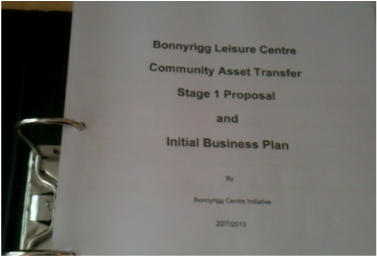 We are a network of Bonnyrigg residents passionate about nurturing sustainable community in fun ways. We do it by finding creative ways to connect your passions with Bonnyrigg's needs as part of their everyday lives. Our ethos is to do this in a grass roots way. We are a 'Pop up Hub' rather than a physical one, popping up at various times and venues in Bonnyrigg. You can join in by coming to a gathering. We meet roughly each fortnight and have a social hour followed by a meeting. Feel free to drop in and chat. We are a pretty laid back bunch. Or come to a larger social like the Bonfire, Wacky races etc. The best way to keep up to date by getting emails and like the Facebook page. 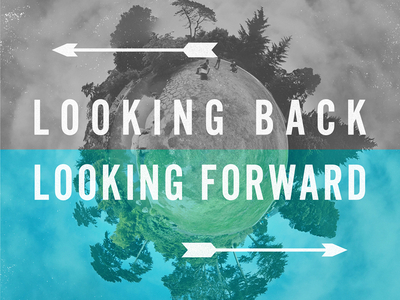 Your also very welcome to become a Hub member with opportunities to shape the direction and vision. A small group of local residents would like to get together to bulk buy health foods through a food group via Suma or GreenCity so they can get 40% discounts.​ If your interested subscribe to the email list or email us​, to get the updates. Following last years successful pilot of this innovative workshop, we will be harvesting willow from our community willow bed and making Christmas willow wreaths, while getting into the Christmas spirit with carol music and mince pies. The children did an excellent job getting the hang of it. There have been ongoing interest in piloting a community cinema night. Maybe starting with a sing along like Frozen or The Sound of Music. If your interested subscribe to the email list or email us, to get the updates. Its been 20 years since Bonnyrigg had a community bonfire. The Hub brought it back in partnership with Bonnyrigg and Lasswade Community Council. It was a roaring success with 350+ people coming, a £Nil budget and 7 days to organise. The second Wacky races but this time we tried to run the event with a budget of £30 instead of £800. It was great fun. The carts were works of art. Finishing with a 20min go cart building challenge. Go to our Facebook page to find more. We had a great AGM on 27th April that was the culmination of getting all the administrative due process aspects of the Hub in place. Social time followed by electing directors. ​We harvested the community willow bed and distributed the 10 names varieties of willow amongst the town to Burnbrae Primary, High school CDT department, the base, and other local residents who either planted them on or made things with it. 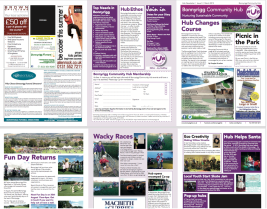 A huge effort went into creating a newsletter that helped people understand the Hubs Change of Course after the Council decision to demolish the Centre. It was hand delivered to the houses in Bonnyrigg. We established robust democratic systems for the first AGM to stand us in good stead for future years and future growth of membership. Since the direction of the Hub had changed from the building to a pop up hub approach we confirmed levels of membership. December- Every year Bonnyrigg gets a special pre-Christmas visit from Santa, especially arranged by Poltonhall Gala Day group. In 2014, with some extra help from Bonnyrigg Hub, Santa was able to visit all the streets in Bonnyrigg. More.. Here's what some folk involved in cheerleading say about their experience about getting space in Bonnyrigg. Quite a surprise to see how hard people are finding to find space to reliably rent. (Tour Video of Facility) To our great surprise Midlothian Council officers recommended a pause in demolition for 6 months for community asset transfer to be considered, and for a formal process to be agreed. Midlothian Councillors unanimously agreed because their lawyers said Fields in Trust, the overseers of the land, would require this before they granted permission to demolish. A huge range of people turned up on Sat 8th June at 1pm in George V Park to show that they want to have a chance at designing their own community facilities in this building. We’re asking for a year to work together and decide as a community what would be best for the centre and the people of Bonnyrigg. Our first newsletter to get the public informed of the planned demolition. 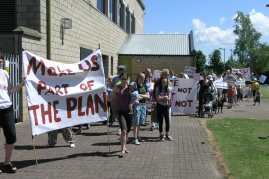 Up till now Midlothian Council refused to inform the public of the demolition. 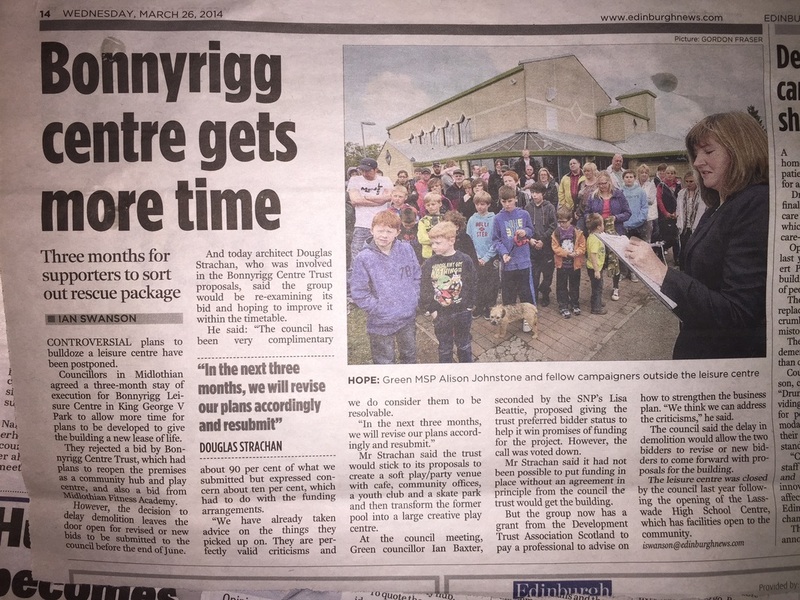 Bonnyrigg ward Councillor Ian Baxter (1 of 3) writes compellingly about the reasons why he has changed his mind and now thinks the Leisure Centre building should be granted a stay of execution. 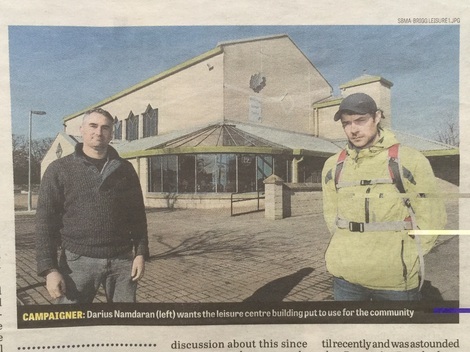 March 2013 Midlothian Advertiser puts up the first public article informing residents. Councillors Milligan and Constable have known about demolition plans for over 2 years. Public finds out with 4 months to go.